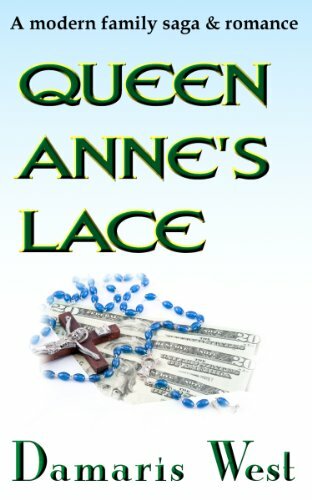 about this book: 'Queen Anne's Lace' is about a family and what happens to them in the space of a year. It starts off with the death of the husband and father, and it ends with the christening of the first grandchild. In between, the wife and mother tries and fails to enter the religious life, the eldest daughter becomes pregnant and marries her partner (in that order), the son finds a 'society' girlfriend, and the youngest daughter falls in love with a disabled man very much her senior who subsequently becomes a key player in the denouement. Much of the action takes place in a cottage which the family own and around which the main controversy is centred. I was inspired to write the book by my own family. I'm one of three children, and our father died when we were at roughly the same ages as those of the protagonists in my book. None of the characters match with us, but I wanted to explore in fiction the possibilities between siblings caught in this situation, and the interactions of their different natures. My working title was 'The kingdom, the power and the glory' because my mother once told me that she summarised each of us by one of those epithets. The tone didn't suit the book, and I needed something which would convey interweaving and complexity as well as being thoroughly rural. I decided to call it after the flower Queen Anne's Lace, which is a name used for both wild carrot and cow parsley, when the plant happened to enter the book at a crucial turning-point in the plot. The book is aimed at a broad readership, particularly women - the sort who would enjoy Joanna Trollope, for example. There are no real heroes and no complete villains (although Derek comes close to being one); the characters are about as good as people normally are, when they are prey to loneliness, jealousy, greed and other very human weaknesses. They have bursts of warmth towards each other but afterwards they drift back into the slow dance which maintains the distances between them. I wrote the book in the course of a year. Whenever possible – and I emphasise this: whenever possible – I like to write about a season which is actually in force around me, because it is easier to capture its atmosphere. The book took a year to write and describes a year in the life of the McKay family. I followed them round, season to season. I suppose the hardest part of writing the book was pulling away from my initial idea of 'the kingdom, the power and the glory' which would have been more autobiographical. The finished book is not in the slightest bit autobiographical although of course like all authors I draw on my own experiences. I did very little research for the book – just facts like how flower farms are run on the Scilly Isles – but I did think things through very carefully so that I could describe, for example, exactly how Colin might feel as a disabled person. The writing of 'Queen Anne's Lace' demonstrated to me clearly that I'm one of those writers who 'discovers' where their book is going. I call it 'pushing from inside the envelope' by which I mean getting inside the narrative and propelling it from there, rather than making a plan and filling it in. I'm afraid my main reason for this is that sticking to a plan doesn't feel creative; in fact I find it boring. If one of my characters suddenly shows a propensity for something – a trait which has grown out of the story as I write it – I want to be able to follow it. Plot twists and developments suggest themselves to me as I write. All I would say to readers is: enjoy the descriptions, enjoy the dialogue, enjoy the mischief in the language, and don't try to guess the ending! • "Once I had started reading I found that I couldn't put it down; I can thoroughly recommend it."